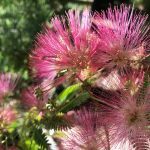 Plant Selection is one of my ultimate favorite ways to spend the day, this is especially true when I am shopping for clients who I feel a part of, and know that I will be adding to the landscape of their dreams. On a particularly beautiful spring day in the Santa Clarita Valley, I headed out en route to Fillmore, a beautiful little town north west of my home that has been featured in Big Love… “The Compound” is filmed there. My destination however, was not The Compound but a wonderful nursery named Otto & Sons that specializes in a plethora of roses among other ornamentals and fruit trees. As usual I was not disappointed. The roses that I ordered were waiting and the coral Drift Roses were in full flush. My client would be pleased with our selection. After a lovely chat about growing vegetables with Mike, I headed back to my car to resume my journey on to the next nursery. The winding roads of Fillmore pass by citrus and avocado groves as well as a large variety of vegetables. Usually I admire the citrus and glance at the vegetables trying to figure out what they are as I speed by. This is a journey I often take, so sometimes I don’t really notice what I am passing, sometimes I even waste my time by talking on the phone. As I chatted away, I was scanning the horizon and suddenly up loomed the most amazing sight, a sight that I’d never noticed before. As far as the eye could see were a sea of nodding cotton balls and behind them statuesque hills. I quickly (and hopefully not too rudely) hung up the phone and immediately pulled over to the side of the road. 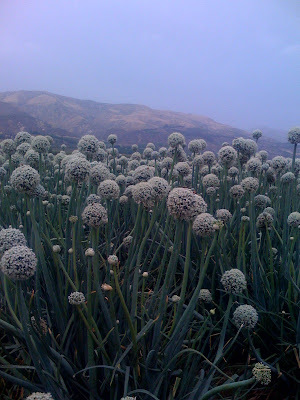 Getting out of the car I realized that I was standing in front of a huge onion field and I was mesmerized. Silently thanking my husband and kids, for buying me an iPhone last year. I snapped photos of this wonderful scene. Being thoroughly entranced I did not notice the hundreds of bees alighting all around me, however I had no reason to fear for they were as captured by the onion flowers as I had been. I breathed the deep clean (yes clean) smell of spring before I headed back to my car and continued my journey. This time of the year is truly magical in this little part of the world.